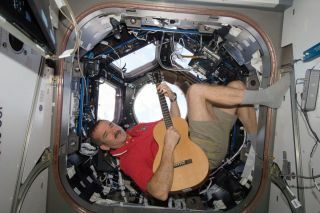 Astronaut Chris Hadfield's tweeting and guitar-strumming from orbit make him a popular draw with worldwide audiences. While Chris Hadfield continues to rack up mileage in space, the Canadian captain-to-be of the International Space Station also reached a different milestone Wednesday (Jan. 9): 150,000 Twitter followers. Hadfield's growth on the social network exploded since launching to the space station Dec. 19. According to the Canadian Space Agency, Hadfield's followers numbered about 20,000 at the start of his five-month mission. Hadfield's pithy observations of life in orbit — and his now-famous joke with William Shatner, who portrayed Capt. James T. Kirk on "Star Trek" — helped propel him on to the world stage, one Canadian reporter said. MacMillan was not able to speak to how much Hadfield — who also reached orbit on space shuttle missions in 1995 and 2001 — is resonating among the audience of the national Canadian newspaper, though. Also, a story charting the captains' interaction did not get that many clicks from readers, she said. However, other institutions said Hadfield's coverage is making waves among ordinary Canadians. The Canada Aviation and Space Museum, which is based in Canada's capital in Ottawa, ran special programming over the holidays to coincide with the first few days of Hadfield's space mission. Reports from the museum indicated the programming was popular with the young student audience. Stephen Quick, director-general of the museum, admitted it is difficult to quantify how much of an impact Hadfield — who will become commander of the International Space Station's Expedition 35 in March — has on the popularity of particular exhibits. But for what it's worth, the Living in Space exhibit, which devotes extensive coverage to Hadfield's high-flying exploits, attracts children and adults alike, he said. Hadfield also draws a crowd during his appearances at the museum, Quick added. "The man is a quintessential speaker, and he can talk to 10-year-olds or he can talk to a group of adults, and they come out spellbound. It's amazing," he said. A flat cutout of Hadfield at the museum, set up as part of an ongoing Canadian Space Agency contest, always seems to have somebody beside it getting his or her picture taken, he added. The museum, which sees 60 percent of its 195,000 attendees every year come from outside of Ottawa, plans to extend its space coverage due to the popularity of the Living in Space exhibit. In May, it will open a "spaceflight experience" that brings attendees through a simulated training experience for space. One key to Hadfield's success in orbit — besides his innate eloquence — might have been the timing of his launch, the Canadian Space Agency noted. Because his launch day fell so close to both Christmas and Russia's Orthodox Christmas, there was extra time off for the astronauts in orbit. This gave Hadfield more time to set up his Internet connection and take pictures, said Anna Kapiniari, the CSA's strategic communications manager. "We knew that if he had spare time he'd use it communicate the experience," she added, pointing out that Hadfield used to spend lunch breaks during his training days in Russia doing video chats with student groups. While the CSA has not performed a formal media analysis, Kapinari has noted an uptick in media coverage. Officials are also seeing a few more questions from followers of the CSA's Twitter feed. "But I think most of the action is happening on [Hadfield]'s Twitter page," she added. National magazine Maclean's is seeing reader action as well, however. The publication, which mostly has Canadian readership, saw one story about Hadfield rocket to the site's most popular entry this past weekend. In a hockey-hungry country, the story surpassed readership of another article about the NHL lockout being resolved. Hadfield has also emphasized Canadiana while in orbit, whether it be tweeting about popular Canuck foods or doing collaborations with Canadian musicians, pointed out Maclean's associate editor Kate Lunau. After writing a feature article about Hadfield in the fall, Lunau said she received a lot of reader mail praising the astronaut's accessibility to the public. "You get the sense Hadfield is a Canadian celebrity," said Lunau, who frequently writes about science. "People really admire the work that he's done."